Humanities Essay Writing Competition. 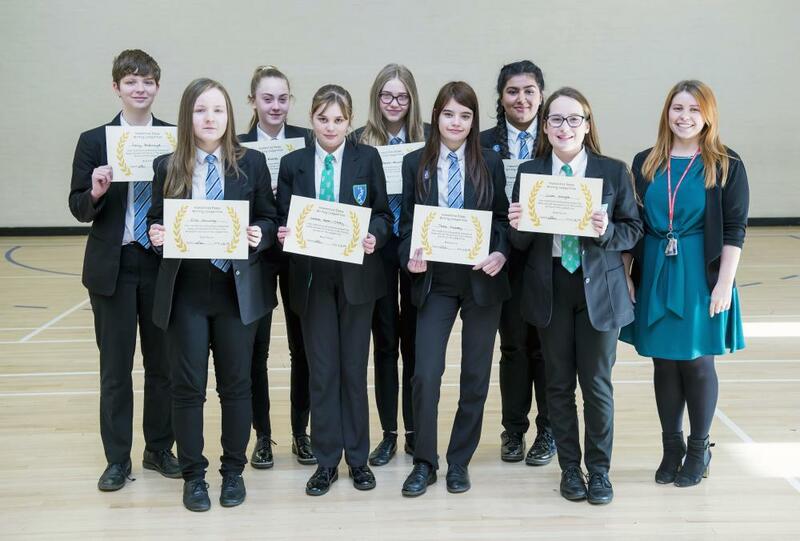 Laura Patrick, Curriculum Leader for Humanities (pictured right), with winners: (Back, l-r) Emily Ackroyd, Ellie Rusling, Amy Baxter-Rowson and Manisha Bains. (Front, l-r) Ellie Gowling, Isabella Aston-Ottey, Thea Hussey and Gabby Jeffrey. More than 40 students entered a Humanities Essay Writing Competition. Laura Patrick, Curriculum Leader for Humanities, said: "There was a really high standard of essays. We were very pleased." The students were given a number of potential questions from all Humanities options. The entry level was so high that teachers chose three student winners from each subject area (History, Geography and R.E.). Laura said: "The winner in History, for example, Isabella Aston-Ottey completed a self-researched essay on the impact of migration on the UK since the Vikings which, despite being a year 7 student, was comparable to a high quality GCSE answer. The standard was very impressive."